Now You’ve got a Ticket to Ride! In lieu of an FDQ today, we’ve got something a little different going on. You may notice we’ve been reviewing Ticket to Ride games this week. And you may notice something else… a new “GAMES” tab up at the top of the page. We’re happy to announce that we finally completed our own personal TTR custom map design! We originally started this design for for the Days of Wonder design-your-own-map contest, but clearly, we didn’t win that. Still, we felt like we had a solid idea and our playtests were great fun, so we decided to produce some high-quality Print-and-Play files to share our little expansion with the world. Hit the jump for more details and a little behind-the-scenes! 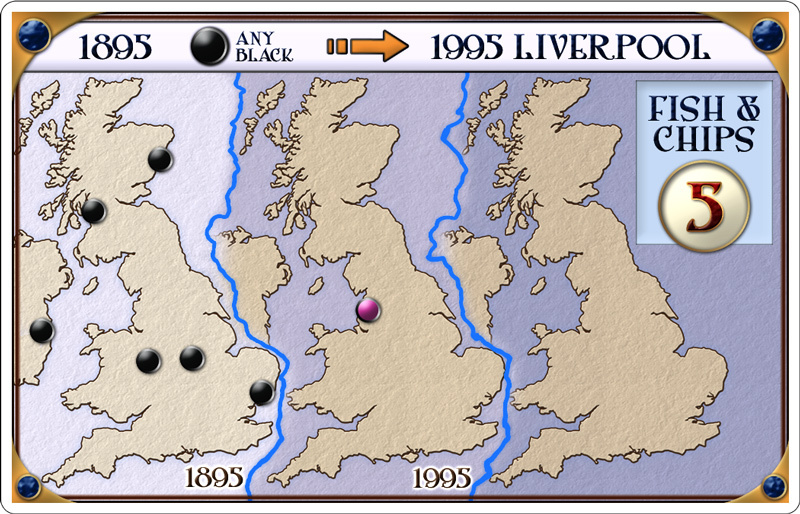 Our map is called Ticket to Ride: Centuries. We think it’s unique in a few different ways. First of all, it’s a time-travel map. Yes, instead of just one large country, we’ve got the same country 3 times, as represented by 3 different eras, or “centuries.” However, this isn’t just “now, the past, and the future.” Our time travel is based on H.G. Wells’ The Time Machine – thusly, 1895 is treated as the “modern era” while 1995 and 2095 are the future as someone in 1895 might have imagined it. How does this theme all come together in a simple TTR map? It’s a bit of a challenge to bring a more storied theme into a very theme-lite game like TTR, but we pulled out a few tricks. First of all, the tracks and connections of each era are designed differently. With the 1895 “Modern Era,” we attempted to match the tracks and connections with actual rail lines that existed in 1895. By 1995 (as perhaps imaged by someone from 1895), society has reached it’s technological pinnacle; train routes are faster, shorter, and just about every city is connected directly to its’ neighbors. But by 2095, society has become passive, laid back, at ease, and many of the rail lines are degenerated and unusable. Rail lines that do exist travel lazily across the land, and Scotland has become all but cut off from the rest of the country. To further color this theme, we changed “Destination” tickets to “Deliveries.” Instead of arbitrary starting and end points, each Delivery card features a good or product of some kind that someone wants delivered. In some cases, this is technology brought back from the future; others want to retrieve lost historical artifacts from the past. Adding these deliveries adds a bit of flavor to the game (and also allowed us to inject a bit of humor). In addition, we decided to break out of the standard “city – to – city” tickets. Our cities feature one of 5 colors, representing different types of goods – technology, culture, commerce, Luxury, and neutral. Many tickets feature destination colors instead of specific cities, allowing routes to be completed by connecting to one of any of the cities that match the correct color. Designing this variant proved quite challenging in many ways. You might not believe all the little details we had to think through to solidify the concept into an enjoyable play experience, even though it’s based on a well-tested and incredibly solid game design. We wanted to create a different experience, more than just “a different map,” and the time-travel solution definitely forced us into that direction. dealing with a continent 1/3 the size of a normal TTR map resulted in shorter, tighter routes inherently. Even though there are 3 versions, it’s still generally smaller and tighter than other TTR maps. So, creating the Delivery cards with colors-as-destinations not only gave us a new and creative gameplay experience, it helped deal with the lesser-amount of space. However, this also caused some problems. In our initial playtests, the multiple-destinations combined with time travel (you literally have to think 3-dimensionally) made it extremely challenging for players to figure out where to start. In the original TTR, you have tickets with a start and end city, so it’s very clear where you need to go. But when you have 4 cities to choose from for both your start and end point, your brain doesn’t even know where to lay the first track. So, to solve this, we took a cue from TTR: Europe and added Special Deliveries – essentially Long Routes that always had a city – to – city destination. Each player was guaranteed to get one of these, in addition to 3 other tickets. Once a player had a single solid destination to deal with, they could then work from there to connect to other colors. We also had some issues with the time travel. We wanted to keep with our theme, which meant technical “start” and “end” destinations, even though you didn’t have to lay your tracks in any particular direction. Unfortunately, listing start destinations first caused some issues – sometimes start was in 2095 and end was in 1895, sometimes the other way around. Without consistency, it was once again hard to wrap your mind around where to start and where to go, and people got confused about which time they had to end up at a particular city. This is where Graphic Design sneaks it’s way in – to solve this problem, we sorted the dates in chronological order, but added an arrow pointing in the direction of the delivery. Not only did this help us keep our theme, and made it easier to track which year you had to reach each destination, but the arrow itself added clarification and made it easier to build routes between colors. This map is different than other TTR maps, in that it’s more about creating an efficient route than simply connecting sets of cities. While tickets are generally worth fewer points, you might earn a significantly larger number of tickets simply by creating a route that efficiently connects colored cities in every era. In the end, I think we have a pretty satisfying product. The game is now out there, for you guys to play and enjoy. All we ask is that if, while playing this variant, you find any issues, any broken tickets that are worth way too many points (or not enough), or notice something else not working, let us know. Consider this a “beta” version – we’re always willing to make updates to make this thing better. And since it’s free and print-and-play, we can make changes easily.